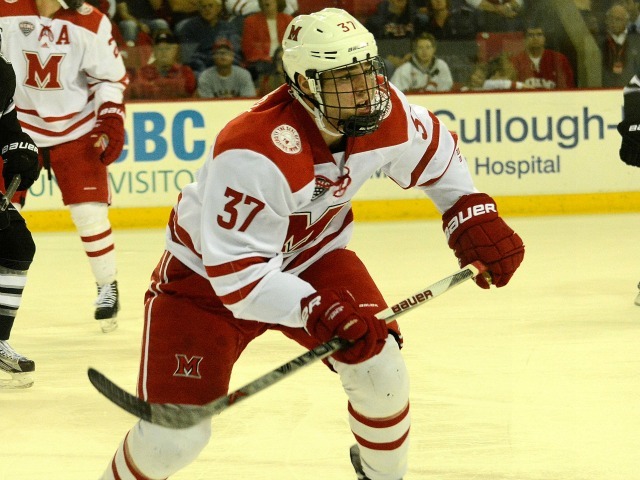 PLYMOUTH, Mich. – Miami was held to three goals in its first two games against Providence last weekend. But the RedHawks rediscovered their offense in their first road trip of the season in a 7-5 win vs. the U.S. National Development’s Under-18 team in an exhibition contest at Team USA Arena on Friday. Gordie Green and Grant Hutton scored two goals each, and Josh Melnick led all scorers with three points, all on assists. 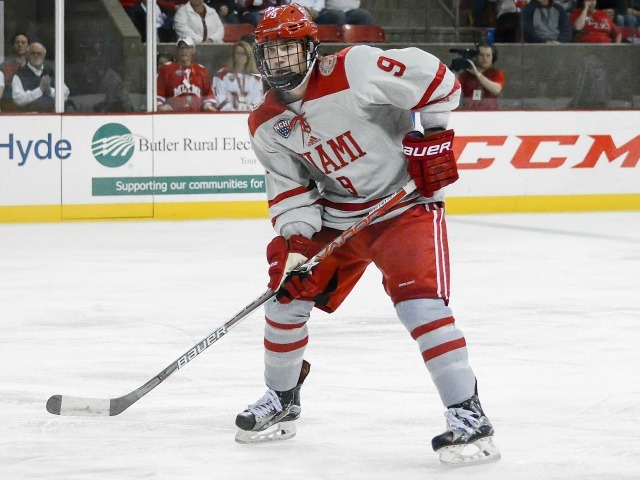 Miami (0-2) fell behind when Jack DeBoer banged home a rebound off a point-blank shot 9:19 into the first period. The RedHawks would score the next four. Hutton ripped a one-timer off a cross-crease pass by Melnick with 8:34 left in the opening frame, tying the score. Miami went ahead when Hutton buried a shot with one second left in the stanza. 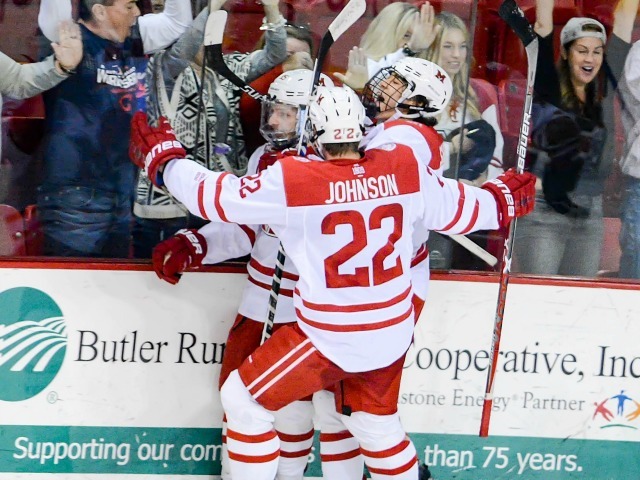 Melnick slid a pass through the slot to Green for a tap-in goal 3:45 into the second period, and Ryan Siroky scored an unassisted goal to extend the RedHawks’ lead to three. But the USNDT tied it with three goals over a 9:25 span of the middle frame. 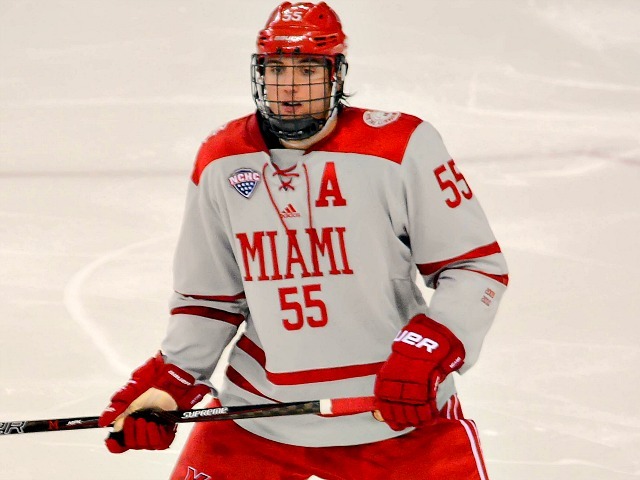 Zach LaValle put Miami ahead, 5-4, but Team USA rallied to tie the score again on DeBoer’s second marker of the night just over a minute into the third period. Finally, the RedHawks went ahead for good on the flashiest goal of the night. Melnick lost his stick but entered the offensive zone anyway, centering the pass to Green for a breakaway. Green buried his shot to make it 6-5. Carson Meyer tapped in an empty netter with a second remaining to cap off the scoring. Louie Belpedio and Phil Knies also picked up a pair of helpers for the RedHawks. Jonathan Gruden, who is a Miami commit, dressed for Team USA and scored a goal. Miami travels to Maine for a two-game series next weekend.